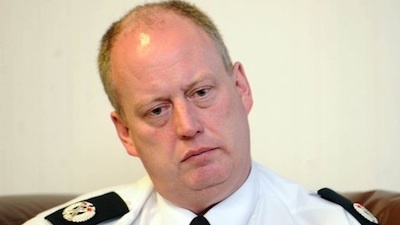 The new PSNI Chief Constable in the north of Ireland has been named as George Hamilton, a veteran of the RUC who is currently serving as the Assistant Chief Constable (ACC) in the PSNI. Mr Hamilton, who started with the RUC in 1985, will take up the role of Britain’s top cop in Ireland when Matt Baggott formally retires later this year. The approval of a figure who was at the heart of the conflict throughout some of the worst years of RUC repression and collusion represents a political gamble for Sinn Fein. However, both Sinn Fein Deputy First Minister Martin McGuinness and DUP First Minister Peter Robinson have welcomed his selection. Mr McGuinness said he wished him “every success in his efforts to ensure the fair and democratic implementation of policing in the north of Ireland.” Mr Robinson said he was “confident George will use his considerable experience gained over many years to deal with policing issues”. SDLP Policing Board member Dolores Kelly said it had been a historic day when a former RUC man could gain the unanimous support of the Policing Board. DUP Policing Board member Jonathan Craig said Mr Hamilton has a “long history of service in Northern Ireland and knows the intricacies and complexity of issues facing policing here”. British Direct Ruler Theresa Villiers wished Mr Hamilton “all the very best”. “This is a time for strong leadership and I am confident that George Hamilton will provide this,” she said. In his first public statement since being selected as PSNI Chief, Hamilton denounced an incident at a hotel in Derry on Thursday night. At around 11pm on Thursday, a holdall was hurled into the Everglades Hotel in Derry by a man who shouted ‘IRA’, and the hotel was evacuated. Following an intervention by a British Army unit some three hours later, the device burst into flames, causing visible fire damage to the reception area. No organisation has claimed responsibility for the incident. The hotel’s role in hosting a PSNI recruitment campaign last week has been cited as a possible motivation for an attack. There have also been bomb alerts in Lisburn, County Antrim this week as a result of “suspicious objects” being identified in the town.